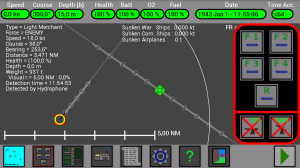 To launch them press on the buttons in the right of the screen (F1, F2, F3, F4, R). 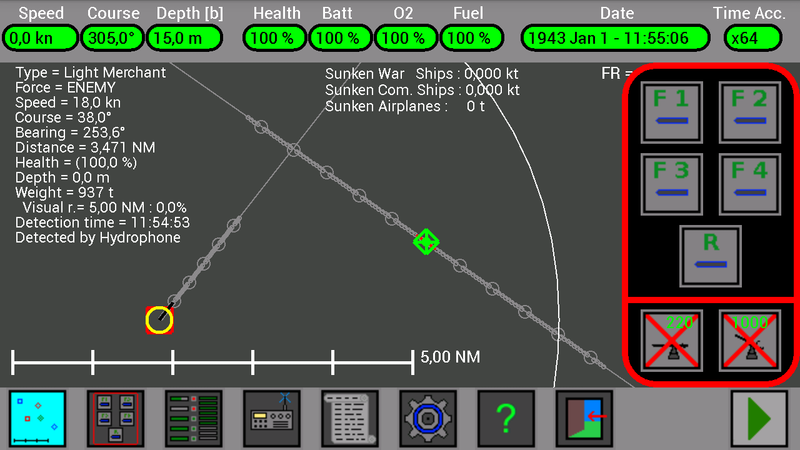 The line of your U-Boat has 5 circles in the front of your submarine and 5 circles in the rear of it. 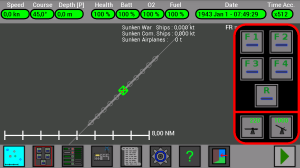 These 5 circles are at 0.5 NM, 1 NM, 1.5 NM, 2 NM, 2.5 NM from the tubes and indicate where a torpedo will be 1, 2, 3, 4, 5 minutes after the launch. When an other ship is selected, a line with 5 circles is drawn in front of the ship. 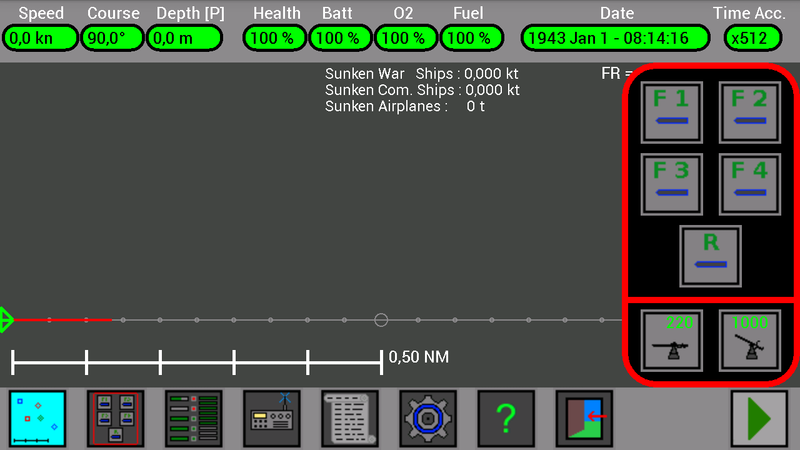 So if you launch a torpedo when the 1° circle of your U-Boat coincides with the 1° circle of the ship (or the 2° with the 2°, or the 3° with 3°, or the 4° with the 4°, or the 5° with the 5°), the torpedo and the ship will be at the same position ! 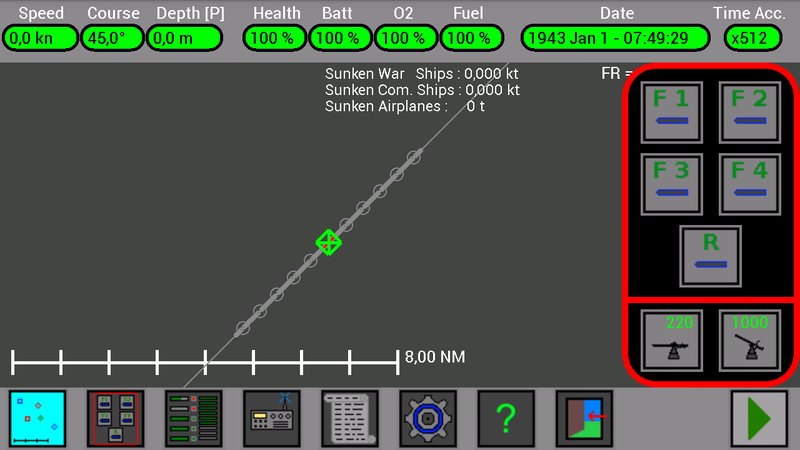 Note: in the figure above there are 2 torpedoes, the first was launched too early (it will not hit the ship), the second will hit the ship because it is launched when the 4° circle of the U-Boat concides with the 4° circle of the ship. Click here for a first practical example. Click here for a second practical example. 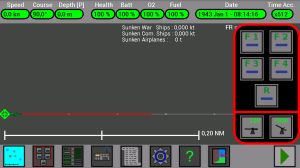 When the torpedoes are launched, they are not immediately ready to explode, they need a short time to become active. 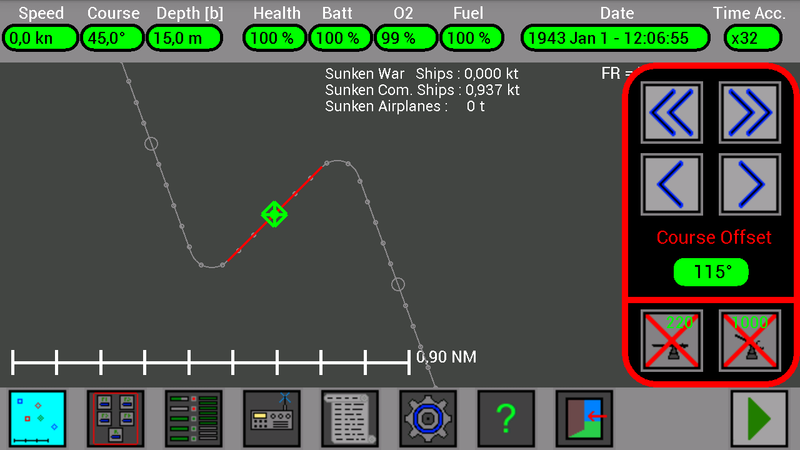 While the torpedo is in the red zone of the line, it is not yet active and can not explode. 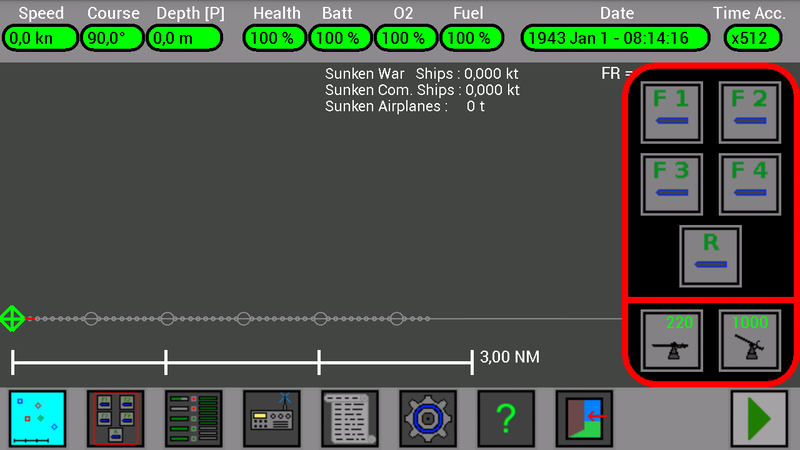 Usually when you launch a torpedo you can ignore this detail, it is useful only when your U-Boat and the ship are really near. Note: the enemy warships often (with their sonar) detect the torpedo incoming and are able to change course in time ! Sometimes, however, launching a torpedo at an enemy warship too close could prevent you to go in time down into the deep to avoid depth charges ….. 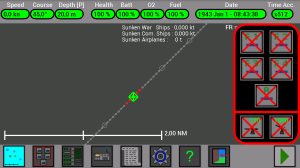 The range of the torpedo is about 2.7 miles (2.7 NM). 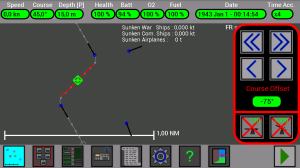 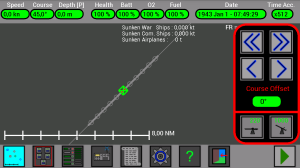 With these buttons you can set the Course Offset of the torpedoes, before the launch, from -180° to +180°. When a torpedo is launched, it will run straight for 250m (0.135 NM) and then it will turn to the left or to the right, to follow the choosen course.